We provide service for all types of septic systems, from residential to commercial, holding tanks, grease traps, baffle replacement, and the list goes on and on. Please check out our entire services below. If your area is not listed, please be sure to contact us. This does not mean we do not service your area! Whether you are on a 1, 2 or the County 3 year mainenance program, you will receive a post card from Tri-County Pumpers, LLC. Just as a reminder, that it's that time of year again, to have your septic system pumped. Selling your home? We are your one stop shop! We contract with Joe Maitland, owner of Branch River Testing. Call our office and I will provide you with Joe's number, he then will contact TCP to set up pumping your septic, and then follow up with the septic and well inspection, along with whatever water tests you need done. 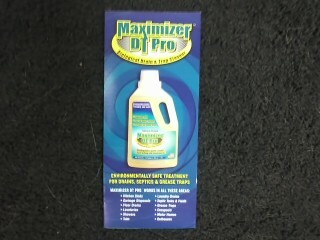 We also carry an environmentally safe treatment cleaner called Maximizer DT Pro. A product that is safe for Septic Systems, creates bacteria, and helps at eliminating odors. Let us know if you are interested, and we will be glad to bring it with us at your time of service.